On Oct. 24, the National Weather Service or NWS in Tiyan, Guam issued the warning that "Catastrophic winds for Tinian and Saipan are imminent" as the eye of Super typhoon Yutu neared both islands. NASA-JAXA's GPM satellite and NOAA's NOAA-20 satellite provided a look at the heavy rainfall and the structure and eye of the storm. Maximum sustained winds in the eye wall are 180 mph or stronger making Yutu a dangerous category 5 super typhoon. At 10:22 a.m. EDT (1422 UTC) on Oct. 24 or 12:22 a.m. CHST (local time) on Thursday, Oct. 25, the NWS noted "Typhoon warnings remain in effect for Rota, Tinian and Saipan. The strongest winds will occur over the next few hours at Tinian and Saipan. The winds will be much stronger than in Typhoon Soudelor!" 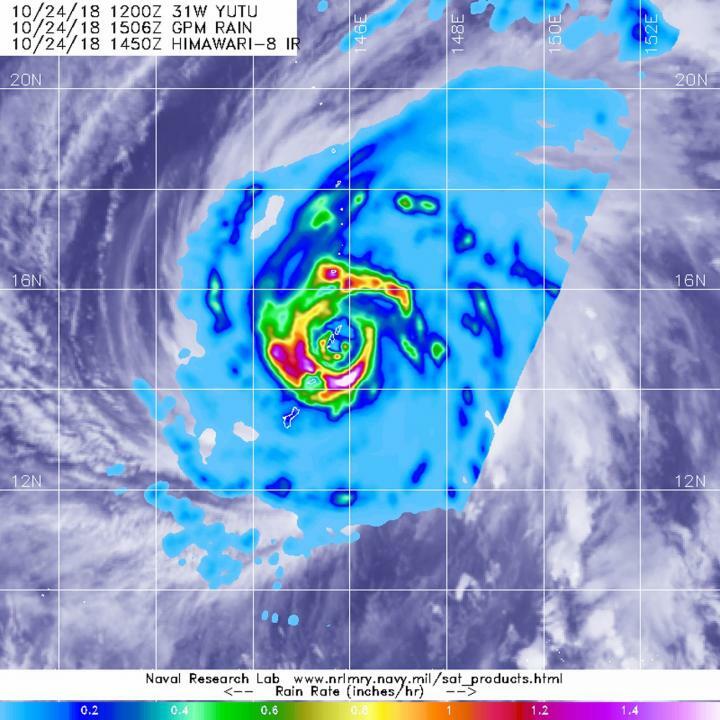 NASA and the Japan Aerospace Exploration Agency's GPM or Global Precipitation Measurement mission core satellite provided a look at heavy rainfall occurring in Super Typhoon Yutu on Oct. 24 at 10:50 a.m. EDT (1450 UTC) as it was battering Tinian and Saipan in the Northwestern Pacific Ocean. At 11 a.m. EDT (1500 UTC) on Oct. 24 (1 a.m. CHST Oct. 25) the center of Super Typhoon Yutu will be located near Latitude 14.8 degrees North and Longitude 145.7 degrees East. That's about 15 miles south-southeast of Tinian. Yutu is moving northwest at 13 mph. The eye of Yutu will pass over Tinian over the next couple hours. Maximum sustained winds have increased to 180 mph. Super Typhoon Yutu is a very dangerous Category 5 storm.